The Mega Der Red Max launches on composite motors, has through the wall fin mounting (with wood being laminated over plywood for superior strength) and our quick release motor retention system (also sold separately), just like our other Pro Series II rockets. Though massive looking, the construction of this kit is not difficult. Building and finish work can easily be accomplished over a few days. Every time I’ve seen one of these rockets ay our club launches, I’ve been drawn to it and wanted one for myself. Even though I haven’t seen any body push it more then 750 feet, the flights are always awesome with a slower take off that’s great for video’s and pictures. I received mine in three days, even though my shopping cart said it would take seven to nine days, so I was extremely happy! I’ve seen other people say that this rocket is an easy build, in a lot of ways it is, but I wouldn’t say it’s a good rocket for a novice. The fins are the hardest thing to build, because they’re a three ply system. There’s some tricky gluing of balsa sheets, tracing and cutting by j=hand. Then you have to glue all three pieces together, which I suggest cutting the two outer balsa pieces slightly bigger. It’s easier to line up the three pieces and it’s a lot easier to sand them down to the correct dimension. I can’t wait for the maiden flight and to put a more powerful motor, like the H90 classic or a H143 Smokey Sam. 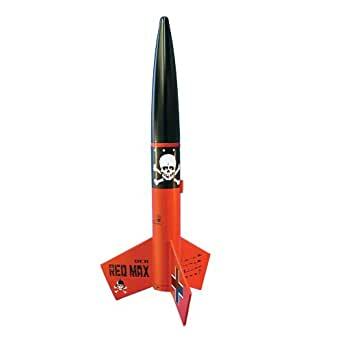 The Mega Der Red Max is an impressive model rocket kit. It’s probably not a good kit for younger or novice builders. I spent several long days assembling and finishing it before it was completely ready to fly. The first launch was impressive using an “F” motor, but our final launch was breathtaking using a G80-7T motor! G-class composite motors are loud! The rocket sustained a little collateral damage to the nose cone after the last launch, but it’s nothing a little epoxy can’t fix. Definitely recommended! Great service from the Seller, I’ve bought several items over time and prompt shipping thus far. The kit is designed for those with some experience building rockets and looking for the next step up. Great flying model but my only gripe is the fin assembly process. I suggest using epoxy and superglue (CA) since this will not warp the fins like wood glue does. I neglected that and had to spend some extra time finishing the fin edges to make them even. Overall a very good value for a large rocket kit. Beautiful! My first mid powered build. You can use G’s on this thing! Awesome rocket, I can not wait until I finish it! Very happy!